The United Kingdom finally voted to severe itself from the European Union last week, in what is no doubt a landmark expression of citizens’ rights to self-determination. The build-up to the Thursday referendum was simply electrifying as the whole world waited to see where the pendulum would eventually rest. And when the votes were all counted, a majority of the people voted to leave the EU, thus ending an era of a broad-based united Europe. One of the things I observed in the excitement about voting to leave the EU, or Brexit, as they dubbed it, was that many proponents made it look as if voting to leave was synonymous with voting to re-affirm the UK’s independence and perceived superiority. And the British so love that feeling of superiority. Interestingly, this newfound independence of the UK was delivered to them via the sweet tongue of Nigel Farage, the Member of Parliament elected on the platform of the UK Independent Party. But the final victory belongs to the citizens of the UK who chose to believe the lone Independent Party voted the way they voted. As usual with votes of such a close result, there is bickering, nay, sour grapes in the camp of those who voted to stay but were defeated. Unfortunately, they have lost the votes and they must live with the consequences, along with those who won. And it doesn’t matter if, as it is being claimed, some of them were just driven by mere UK-centric sentiments and a disdain for too much foreign influence on their ways of life. It is apparent that many UK people found it difficult to accept the tag of European, as opposed to being simply, British. I equally met many British citizens who were even more comfortable with being simply English than being British. I know of a few who said as Englishmen and women, they sometimes feel awkward carrying passports that announced them as “citizens of the United Kingdom”. In fact, once an English friend talked about “African dinner” and I asked if there is any such thing as “European breakfast”. She quickly rejected such, but could at least talk about “English meals”. At least, she got the point I was making about diversity. With such diversities and differences expressed, I could truly relate with many Nigerians who say they see themselves more as representing and belonging to their various ethnicities and maybe geopolitical expressions than they see themselves as Nigerians. But while that may be similar, the difference lies in how much the central government strives to build a united country where the citizens are not always reminded in action and inaction of the state that what they suffer is not necessarily as a result of their ethnicity. There are a few more lessons I see in the Brexit referendum that Nigeria could learn from. Recall that the decision by the UK to join the EU was initially made on behalf of the citizens by the government, made up of their elected representatives in Parliament. But consistently, and after seeing how they fared within the Union, the UK citizens kept demanding their rights as citizens and holders of the sovereignty to determine whether or not they wished to be in the EU. Their demands may initially have been scorned, but eventually they had their ways – an opportunity to vote. The lesson here for us in Nigeria is that even if we may concede our rights to decision making to our elected representatives in the legislature, we still reserve the power to generally decide some fundamental questions and that through various other democratic means, including referendum. In Nigeria’s context, such questions would include decisions as to the structure of our country and the union, division and enlargement of component units and territory. On the face of it therefore, no question about Nigeria’s existence, continued existence and nature of relationship necessary for such existence should be considered “off limits”. We may wish to learn from the referendum conducted in Scotland in 2014 which eventually led to the country voting to remain as part of the UK. Interestingly, Scotland is now reconsidering another vote on that issue after last week’s Brexit for which they overwhelmingly voted for the UK to continue in the EU. Back to the Brexit issue, many UK citizens believe that keeping their borders wide open to all citizens of the EU impacted negatively on their individuality or Britishness, if you would. It also made them obliged, even if morally speaking, to accepting immigrants from outside Europe, where such persons had been accepted into any of the EU countries. I daresay that many of those who voted Brexit, especially the young people did not bother enough to find out all the full information about the pros and cons of their continued EU membership. Those categories of citizens are usually the ones who easily take a position on an issue in any voting population and run with it very passionately. Their views may be the majority, but may not necessarily be the best for all. Such passionate and expressive citizens have the tendency to also use the power of their number to awe the rest of the society. They and their views often appear more popular than those of the elite or the intelligentsia and they tend to more driven by populist and even mob sentiments. There is reason to believe that many who do not necessarily agree with them may not be bold enough to state their opposition for fear of being branded as saboteurs. Thus, those who want to see a different country or structure than the status quo can easily resort to propaganda, painting a picture of a future utopia if the views they canvass are allowed to be implemented. There was a good dose of propaganda that pulled voters to the Brexit. One of such was the claim by the Brexit campaigners that leaving the EU would free a whopping £350m a week to the UK, being the cost they pay for EU membership. These free funds, they said, the country would spend on the National Health Scheme. But just two hours after winning the vote, Farage, the UKIP leader, said the money could not be guaranteed and claimed he would never have made the promise in the first place, even though the promise was emblazoned on some campaign vehicles used by his team. Such experience above should weigh in the minds of many Nigerians who are now excitedly mulling a possibility of referendum in Nigeria, for any of several causes. 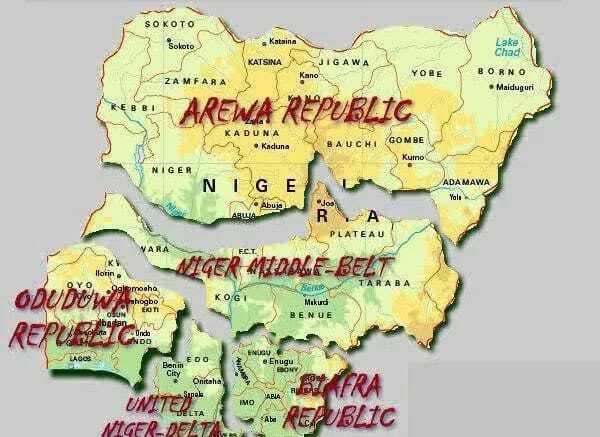 No doubt, the most popular one is the call for Biafra referendum and, possibly a Niger Delta referendum. I daresay that if any of those referenda should happen now, the result may be as seen in the UK. There may be good reason to complain about the structure and operation of Nigeria today. But those who demand separation, division and the likes should also be sure they have a clear picture of what the future, post referendum, may be. How clear and detailed are those who excitedly make demands for sovereign states and nations out of the present Nigeria about how those proposed new countries would operate and survive, differently from the present country? Have we taken a good look at how democratic, free and fair, the current managers of the proposed independent entities are? In the event they ever succeed, who would be the ones to operate the new states and with what level of integrity would they operate? And for the more enlightened and more comfortable elite who stay aloof in cities, far away from their potential new sovereign states, have they considered the immediate consequences of referendum results? Would they hope to simply take a walk home and be handed over the new independent states to run based on their sense of fair play and justice? I am not aware of anywhere in the world such ever happens.